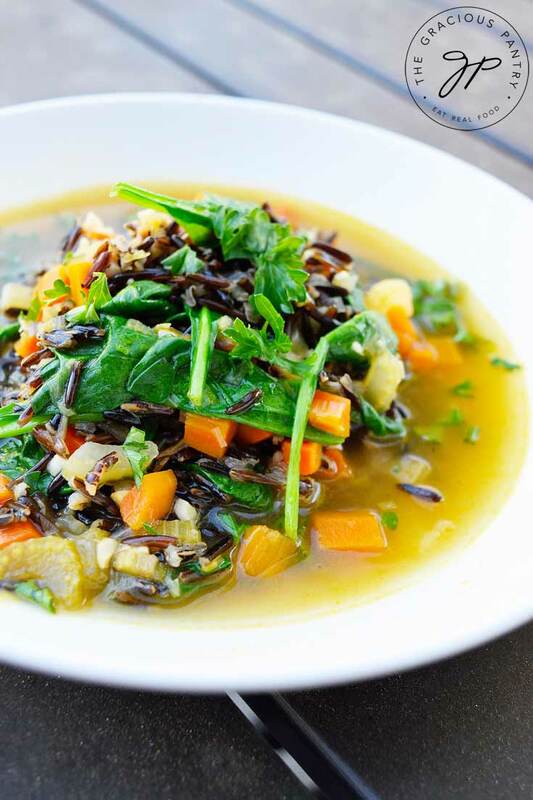 This clean eating wild rice vegetable soup recipe is light yet hearty. This delicious soup was a project I had for school. I’m taking culinary classes online and I had to develop a recipe using certain techniques and knife skills. It was certainly a challenge, but in the end, the soup was delicious. Well worth the effort! I’m still waiting to hear back on my grade, but I think I did pretty well! One of the main techniques I had to work on with this recipe was sweating the vegetables. Up until now, this has actually been a frustrating process for me. I couldn’t get the heat right or keep the vegetables from browning. But for some reason, I broke through that with this recipe and now I want to sweat all the vegetables, all the time. Sweating is so wonderful for adding flavor where you don’t want to add a bunch of salt or fat to get a well flavored dish. It pulls the flavor out of the vegetables so that they are fully available for seasoning the broth. It also allows any broth you use to not be colored by caramelized or browned vegetables. Cut your vegetables down to a small dice. They need to be cut small for this to work well. Start with a cold pan and turn the heat to the lowest setting you have. Add only enough fat to gently coat the vegetables, not the pan. This should be a relatively small amount of oil. Keep the lid off so you can hear what’s happening in your pan. The sound is everything. It should be a very low, barely there, sizzle. Stir occasionally to be sure nothing is browning. You do not want these vegetables to brown at all. Wilt, yes. Brown, no. Take your time. Sweating can take 20-30 minutes, depending on how much food you have in the pan. Don’t rush this process. While sweating vegetables might seem tedious, I assure you, with a little practice, it’s actually a very basic and simple procedure. Now that I have have the hang of it, I will be doing much more of it. I love how it pulls so much flavor from the veggies. Well worth the extra few minutes at the stove. Give it a try! A deliciously light, yet hearty soup that pairs well with almost any main course. Turn on the heat on low and let the vegetables slowly come to a very low sizzle. The perfect temperature for this is where you can just barely hear the sizzling. Cook like this, stirring occasionally, for about 20 minutes. You are sweating the vegetables to bring out their flavor for the broth. When the time is up, your green vegetables should be wilted, but nothing should be browned. 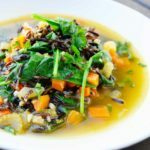 Transfer to a soup pot and add the broth and wild rice. Cook for about 40 minutes, or until the rice is cooked. Turn off the heat and stir in the spinach leaves. Season with salt to taste and garnish with fresh parsley. I love your recipes! What would be a good substitute for celery in this soup. My husband turns his nose up at anything resembling or tasting like celery, but cooking without it leaves most recipes short on veggies. Cheri – I would just cut the celery into a few big chunks that you can remove after cooking (unless he has an allergy. That’s different.). You can’t taste the celery when everything is cooked.